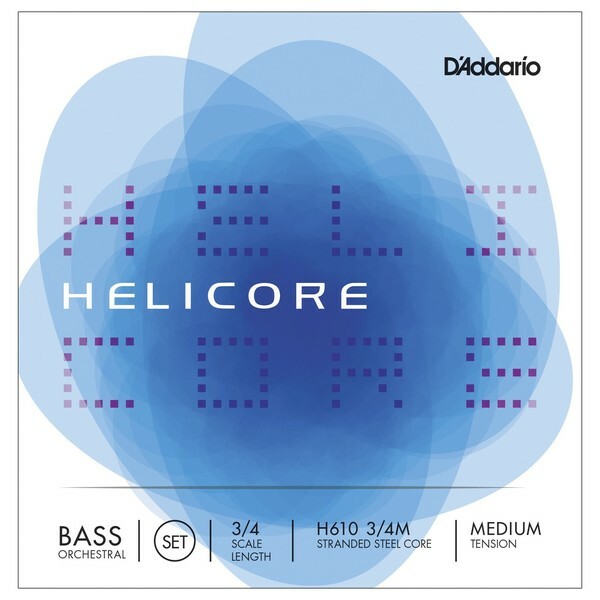 Daddario Helicore Orchestral bass strings are multi-stranded steel core strings that produce a warm tone quality with excellent bow response. The core design makes for strings that are very easy to play under the left hand. Damping is optimized for arco use, making them ideal for symphonic performance. Helicore Orchestral also work well for pizzicato applications where a very warm, less-sustaining sound is desired. Scaled to fit 3/4 size bass with a playing length of 41 3/4 inches (1060mm), medium tension strings are optimized for a majority of players. The H615 Low-C (extended E) string, and the H616 Low-B string are only available as a single strings and are not part of the H610 set.